Aortic regurgitation is also known as aortic incompetence. 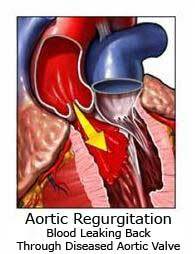 Aortic regurgitation may occur as a result of aortic valve insufficiency. This will result in left ventricular volume overload that later lead to dilation and hypertrophy of left ventricle. As a result there will be a rise in the stroke volume which lead to wide pulse pressure and hyperdynamic pulses. Besides that aortic regurgitation may lead to severe left ventricular heart failure. Aortic regurgitation is associated with connective tissue disorder such as Marfan syndromes, infective endocarditis, elderly people, syphilitic aortitis, non dissecting aortic aneurysm, dilation of the ascending aorta, hypertension and prosthetic valve replacement. Aortic regurgitation may present with signs and symptoms such as wide pulse pressure, presence of additional third heart sound, diastolic murmur at the left sternal edges while patient leaning foward and dyspnea on exertion. Aortic regurgitation is treated with aortic valve replacement and endocarditis prophylaxis. 1.PHORNPHUTKUL, CHARLIE, AMNON ROSENTHAL, and ALEXANDER S. NADAS. "Cardiac manifestations of Marfan syndrome in infancy and childhood." Circulation 47.3 (1973): 587-596. 2.Guiney, TIMOTHY E., et al. "The aetiology and course of isolated severe aortic regurgitation: a clinical, pathological, and echocardiographic study." British heart journal 58.4 (1987): 358-368.